A mix of clouds and sun early followed by cloudy skies this afternoon. A stray shower or thunderstorm is possible. High 76F. Winds SE at 10 to 20 mph..
Hello, I'm interested in finding out more about your It's Re-SET Month! Details for It's Re-SET Month! For most of us, April is already a month to restart a lot of things, but for Thorpe's the "RE" Month is all about Resetting, Remounting, Redesigning and Refreshing that jewelry you've been meaning to (quote) "do something with." 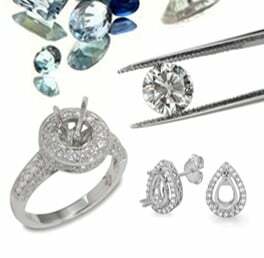 Throughout the Month of April - DIAMOND MONTH - all our diamonds are on sale AND also all of our new ring and pendant mountings, too! So, you know you've been meaning to do this. Take the plunge, Hit the RE-SET button and come in this month - Remember, redoing your jewelry is the ultimate way to Recycle, Renew, Remount, Restring, Refresh and, above all, retain the sentiment as you create something new. What could be more perfect for Spring?